Gearing up for the 2018 ZooGala on Sept. 14 is, from left, Lee McKinney, development committee co-chair; Roddy and Janice McKinney, honorary chairs; Candice McKinney, VIP pre-party chair; Leigh Davis, Sumner Rives and Amanda Davis, gala chairs; Britt Redden, gala advisor; Alex Morton, Birmingham market president of presenting sponsor IBERIABANK; Austin Davis, development committee chair; and Chris Pfefferkorn, Birmingham Zoo president and CEO. Journal photo by Jordan Wald. In southern Africa, a gathering or meeting often is called an indaba. Originally a term for a political conference between tribes, some of the largest indabas in southern Africa today range from conferences for tax professionals to cultural and tourism gatherings. Throughout its existence, the Birmingham Zoo has been a place for children young and old to gather and spend time appreciating some of the most magical animals nature has to offer. That’s why this year’s ZooGala, presented by IBERIABANK has been dubbed “Indaba in Africa.” The event will be Sept. 14. 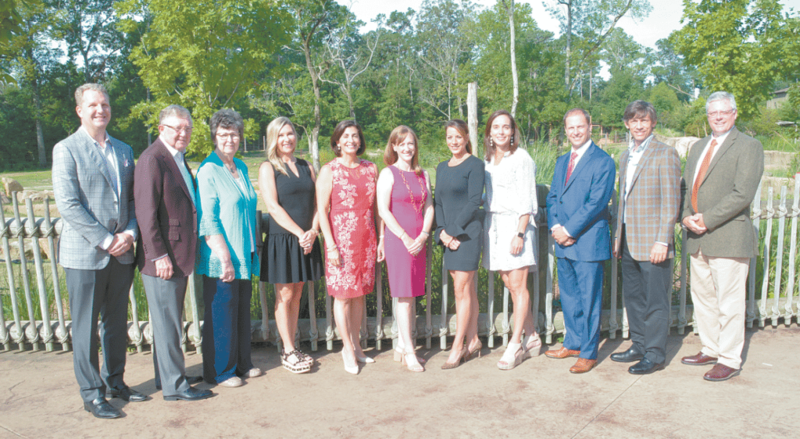 According to the 2018 ZooGala honorary chairs Roddy and Janice McKinney, the evening will celebrate the team of people running the zoo and the work they have done to improve the visitor experience. “Right when you walk in, you see that the work on the new entrance has already started and a lot of changes are coming,” McKinney said. Through continuous improvements – updates, new experiences, new animals and new locations such as the Trails of Africa and Henley Park event lawn – the zoo has been growing. Officials at the zoo now are working on its Renew the Zoo capital campaign, which includes raising funds for the new entrance and welcome center, as well as the forthcoming Asian Passage exhibit expansion. In addition, McKinney noted that the zoo had a record attendance of more than 600,000 people last year and has set a goal to top one million visitors. “We look at the zoo as one of the biggest assets for our youth in the community – not just in Birmingham, but in all of the 30-plus surrounding communities,” Roddy McKinney said. McKinney said he believes having a place such as the zoo, where children from throughout the state are educationally entertained by the natural world, is an investment in the future of the community as those children grow up and become professional leaders. Chairs for this year’s event are Amanda Davis, Leigh Davis and Sumner Rives, with Britt Redden serving as ZooGala adviser and Candice McKinney chairing a VIP party. The VIP party will begin at 6 p.m. in the Trails of Africa, where guests will get the chance to learn more about the zoo’s new conservation program. The main event will be 7 p.m. to 11 p.m. in the Children’s Zoo and will feature an online auction, a cocktail dinner created by Kathy G. & Company and dancing to music by The Main Attraction. The online auction opens Sept. 7. For more information, visit birminghamzoo.com.